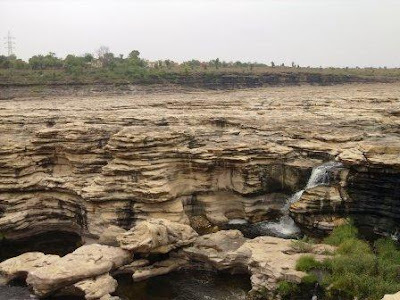 Chulia Waterfall: Chulia fall or waterfall is one of main waterfall in Rajasthan on Chambal River. Chambal flows through the Kundal Plateau, and the Rana Pratap Sagar Dam is constructed at the lower end of this reach, about 1.6 km upstream of Chulia Falls. The chulia waterfall is 5 Km upstream of Chambal river near Bhainsrorgarh. The chulia is a series of huge potholes which have been excavated by chambal on small faults and joints in the kaimur sandstone, which forms the bed of the river near rawatbhata dam site. Q. Chulia waterfall is situated on which river ?